This beer is very unique and inspired by breweries in the Lambic region of Belgium and, especially, our friends at Cantillon. It is 100% spontaneously fermented, meaning yeast is not added. Once the beer is brewed, it is transferred to a cool-ship or “horny” tank located in our barrel room at the pub. There it sits overnight and collects whatever funky wild yeast and bacteria may be living in the room. The next day it is transferred to oak wine barrels where it ferments wildly and ages for a few months. The end result is a wild, spontaneously fermented, sour, and tasty hand-crafted beer! Pours a filtered, light yellow color and a fizzy, bubbly head, immediately dissapearing into small sheets of lacing. Lower carbonated, with a very refreshing mouthfeel to it, due to fresh lemons and a balancing, wooden oak infusion. The aromas unfold just after popping open the bottle, filling the air in my room with a lovely, citrussy funkiness. Reveals even more ripe, juicy citrus when smelling at the actual beer, together with an immense tartness, bedded on glue, yogurt and old leather. Creates an interesting interplay between dough, soft old malts and prickly, crisp lemon, without becoming intriguingly complex. The taste offers a good amount of lemon right from the very beginning, accompanied by easing, bready, musty malts and fermented wheat. Lemons get increasingly more body added, resulting in a very sour, funky tartness, almost numbing the front of my tongue during its peak. Finishes fruity, with fresh pressed lemons, revealing even lemon stones, as for how pronounced the fruit acidity gets, offering an acceptable dryness. The balancing oaky barrel vanishes completely during the beers finish, opening the palate up to pure, sour fruit lemonade. Hammers a bit too hard on the palate, regarding its acidic sourness, preventing the beer from showcasing its other, more subdued flavors. A- Pours clear and golden with a half-finger of bright white tight foam. This recedes to a collar and leaves some lacing. Some nice alcohol legs are observed when swirled. S- The aroma is very sour and there is a lot of Brett funk. Overripe apples, tart cherries, pineapple, and oak tannins. Some Granny Smith apple and lemony sourness. Very complex, refreshing, and inviting aroma! T- Wow, this is warhead sour! Crazy amounts of cherry and lemon sourness. The oak tannins are the only thing restraining and mellowing the sourness. Very acidic and lactic. Refreshing, but bracingly sour! M- The mouth feel is delicate, medium bodied, and lightly carbonated. O- This is an excellent sour, though not for the uninitiated! Maybe lacking the complexity and subtleties needed to make it truly world class, but wonderful none-the-less! Pale gold and clear until you hit the yeast at the bottom. Smells sweet and funky with hay and lemon. Nice sour, tart taste with lots of fruit. Reminds me of unripened pineapple and lemon zest. Nice sweetness and carb. Really great beer. This is the Batch 001-PH1 version, also held for more than a year. It pours from 375ml caged and corked bottle a very effervescent clear light gold with a large head of foam that quickly shrinks to about a 1 finger head but doesn't shrink much more than that. It has a medium mouthfeel to it and the carbonation is also medium inspite of what I saw in the initial pour. It finishes sour and leaves a nice long tasty aftertaste. Man, am I wild about RR American Wild Ales and to me, this one goes just a bit over the top compared to the non PH1 sample. I'm *really* digging this beer and boy, I get this all in a 5.5%abv brew...The drinkability just shoots through the roof!! Bottom line: This may be my favourite offering from RR to date and I've had a fair sampling...all were, imho, outstanding. I still say RR may be the best brewery in America. 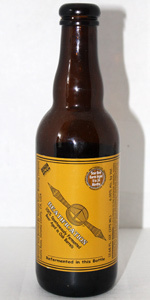 Beatification is another brew that does them proud! Highly highly recommended!! A- Pours a deep chardonnay golden yellow color. Has a very high wine like clarity. Small fizzy head that dissipated quickly. S- Lots of sour apple, some vinegar, some light vanilla, good amount of oak. some white wine character in there. T- Similar to aroma but amplified to an insane degree. Lots of tart lemon, sour apple, and vinegar. Finishes with a dry yeasty note. Has that old barn cellar thing that sours usually have. M- Medium-light the flavor makes this a sipper. O- This is one of the most sour beers I've had and if you're looking for something that delivers in the pucker department seek this one out. It is also somewhat too sour for me in my tastes. It's missing a bit of the subtlety that I got from Supplication. Still an amazing beer and if you want to test the limits of sour seek it out. Bottle aged close to 4 years (2013 edition). One if the best wild ales I've ever had. Lots of fruity flavor and not too sour for my taste. Could drink all day! i got this bottle, along with temptation and supplication, from the recent RRB release, and i've got to say that this is the funkiest, sourest, most surprising beer i've had in a long time. to be honest, i thought i had a bad bottle for a moment - the cork barely popped and didn't look like it had expanded in the bottle very much. upon pouring the light-apple-cider colored liquid into my snifter, i didn't see much of a lasting head and i got the decidedly odd smell of, well, animal sweat. i don't really know how else to describe it, except maybe as the rind of a cheese that the french would call "fromage qui pue." tasting this beer at fridge temperature was also very, very weird. almost painfully like vinegar. my eyes watered a bit. but how can this be the famed beatification? is it infected? well, of course its infected, it says so on the bottle! so i let it sit in my hand for a bit, the snifter resting at an angle in my palm, allowing the beer to warm. and warm it did! now i get so much more off the nose - sour cherry, almost kumquat, a bunch of lemon rind, and a dash of white pepper. the taste has also developed much - also kumquats, brett funk, citric acid, and just a touch of the original malt sweetness that has been feasted upon by tons of little "bugs and critters." cool! the mouthfeel is perfectly round in the first sip and slowly astringent in the finish, leaving me with a mild woodiness before the taste disappears. wonderful. i've left the yeast/critters in the bottle, but plan on drinking that soon. excuse me if i cut out now - i'd like to savor the last few sips of my original pour before i dump in the haziness. Served from a 750ml bottle at EBF 2010 in Boston, MA into a tasting glass at the appropriate temperature (02/20/10). A: Really a unique and beautiful beer. Almost like a neon yellow with a slightly off-white head that quick dissolves in a skin. S: Wow, this is going to be a sour beverage. I must say that I am just now diving in the world of sours and I can certainly appreciate the style, but I am developing a taste and smell for it as I go along. A good degree of funk of citrus, having a heard time with this one. T: The smell was funky, but the taste is out of this world. Perhaps the most unique tasting beer I have ever tried. Seems very well-crafted, but it is so sour and funky. Lots of citrus going on as well as great tartness and no sense at all of vinegar which is good thing, for me at least. I feel fortunate to have be able to try this and certainly appreciate it, but I don't feel that my palate is developed enough to pull out all of its complexities. M: Mouthfeel is quite nice and somewhat lively while being medium-bodied. D: The extremely sourness is the only limiting factor. Overall this beer was a true experience and a great leap for me into sours. Well-crafted from a unique brewery and certainly one I would like to revisit in the future. A: Pours a hazy yellow color with a thin white filmy head. S: Vinegary lemon zest and tartness all going together nicely here. T: Lemon tart are big here. Slight vinegar taste as well. M: Medium body with little carbonation and hardly any hops. D: For the ABV this is highly drinkable. I love the tartness balanced by the lemon zest. Definitely worth the drink.